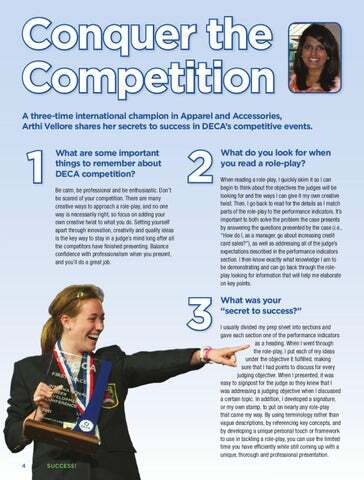 Conquer the Competition A three-time international champion in Apparel and Accessories, Arthi Vellore shares her secrets to success in DECA’s competitive events. 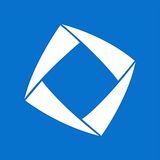 What are some important things to remember about DECA competition? Be calm, be professional and be enthusiastic. Don’t be scared of your competition. There are many creative ways to approach a role-play, and no one way is necessarily right, so focus on adding your own creative twist to what you do. Setting yourself apart through innovation, creativity and quality ideas is the key way to stay in a judge’s mind long after all the competitors have finished presenting. Balance confidence with professionalism when you present, and you’ll do a great job. What do you look for when you read a role-play? When reading a role-play, I quickly skim it so I can begin to think about the objectives the judges will be looking for and the ways I can give it my own creative twist. Then, I go back to read for the details as I match parts of the role-play to the performance indicators. It’s important to both solve the problem the case presents by answering the questions presented by the case (i.e., “How do I, as a manager, go about increasing credit card sales?”), as well as addressing all of the judge’s expectations described in the performance indicators section. I then know exactly what knowledge I am to be demonstrating and can go back through the roleplay looking for information that will help me elaborate on key points. What was your “secret to success?” I usually divided my prep sheet into sections and gave each section one of the performance indicators as a heading. When I went through the role-play, I put each of my ideas under the objective it fulfilled, making sure that I had points to discuss for every judging objective. When I presented, it was easy to signpost for the judge so they knew that I was addressing a judging objective when I discussed a certain topic. In addition, I developed a signature, or my own stamp, to put on nearly any role-play that came my way. By using terminology rather than vague descriptions, by referencing key concepts, and by developing a unique personal touch or framework to use in tackling a role-play, you can use the limited time you have efficiently while still coming up with a unique, thorough and professional presentation.